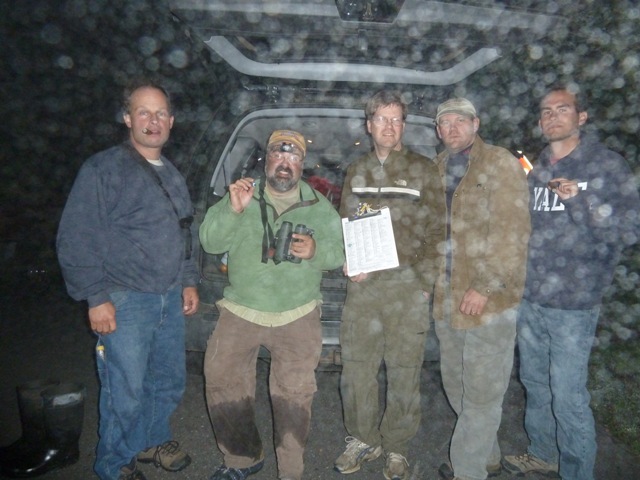 Our team of Patrick Dugan, Frank Gallo, Dave Tripp, Fran Zygmont and myself (collectively the "Raven Luna-ticks") ran our 2011 CT Big Day on Friday, May 20. Our total of 192 species broke the long-standing Connecticut record (186) and, as a nice little bonus, the record among New England states (Massachusetts, 191). So how did we get to 192? History: This was our third year as a Big Day team, previously recording 177 species on 5/24/09 and 185 species on 5/23/10. Read those brief summaries for details on our prior two efforts. Each of us had a fair amount of big day experience before we came together as a team. 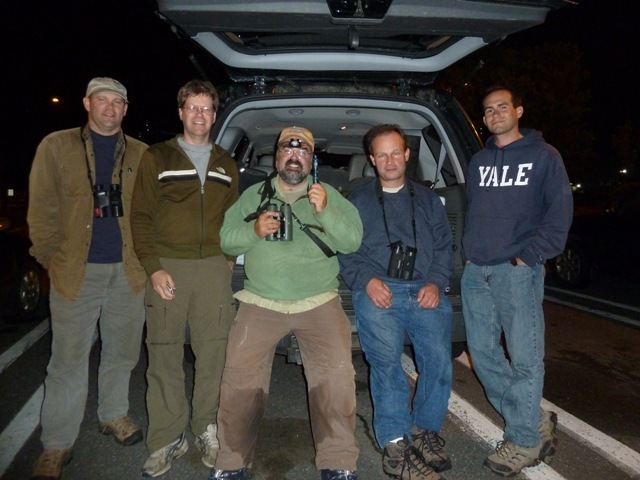 I had done some variation of a CT big day or birdathon for the five or so years before we formed our team. The other four guys had actually been teammates for some very successful World Series of Birding efforts. Scheduling and Weather: We blocked-off a predetermined window of 5 days so that we could choose the exact date last-minute based on the weather and state of migration. We were a bit worried in late April when migration was ridiculously ahead of schedule...it had us wondering if we had chosen a window too late in the month. But the first two weeks of May consisted of remarkably consistent seasonal temperatures with a fair amount of unfavorable wind conditions. As a result the migration schedule had largely returned to normal by the middle of the month. Then, on or around May 14th a large low-pressure system sat itself over much of the eastern third of the country, resulting in several consecutive days of rain and an easterly wind flow for southern New England. This further slowed passerine migration to the point where we actually fell just a bit behind schedule. It was clear that, with so many singing males of the 'earlier' warblers still around (i.e. Yellow-rumped, Nashville, Parula), birds were being slowed down. There were other notable consequences of the poor weather. First, while passerine migration had been seriously slowed down, the shorebird migration was less hindered. Shorebirds are incredibly strong fliers that are very capable of pushing through weather that is less than ideal. This was significant because the migration of singing male warblers peaks earlier in the month than shorebirds do. Since the warblers had been slowed down but the shorebirds arrived despite the weather, it allowed for the possibility of having the best of both worlds on the same day. (It wouldn't work out quite as hoped for, as you'll read below that we ended up with few migrant warblers on our day, but the timing of the migration was very convenient). The other benefit of the rough weather and east winds was the appearance of more lingering waterfowl and unusual gulls throughout the state, both along the coast and inland. Late waterfowl can make or break a May big day effort, and as you'll read below they played a huge role in this year's efforts. Scouting: This year we were determined to spend more time scouting the coast than in previous years. That would be left to me, Gallo, and Dugan. But scouting the coast can generally be left until the week before the Day itself because the important species there are generally migrants. Any early scouting should be focused on inland breeders, so that's what we did. I was off from work during the first week of the month and used that to begin the inland scouting. My plan was to simply collect as much information as I could and pass that info along to our two inland team members, Dave and Fran, so they could better plan the inland portion of the route. Over the course of the week I was able to pin down some scarce breeders in Hartford and Litchfield counties. I also noted the absence of some species at traditional locations, which is just as useful as positive information. As we approached the week before our proposed window, Frank and I started the coastal scouting while Fran and Dave continued the inland stuff. Along the coast, Frank and I welcomed the rain and onshore flow, as lingering waterfowl was abundant, shorebirds were collecting at the typical hotspots, and gulls such as Lesser Black-backed, Bonaparte's, and Laughing were all noted in multiples. While useless for our Big Day, a small flock of three Red-necked Phalaropes in New Haven Harbor was a nice surprise. The inland guys struggled with the weather. The combo of rainy, breezy, and cool conditions made for awful passerine scouting. Breeding birds were singing minimally or not at all during the day, and their crucial nocturnal scouting was almost completely rained-out. We really worked hard the few days before the Day. Frank, Dave, and I took time from work while Patrick and Fran spent time before/after workdays to scout. We were determined to fight through the weather as best we could. On May 15th and 16th, before the heavy rain set in, I spent a sleepless 36-hour period scouting the state (dawn on the 15th til dark on the 16th). I had a fair amount of passerine and nocturnal work to do and decided that a marathon effort was needed if the rainy/windy forecast was going to be correct (and it was). This paid off nicely as a warm, humid, and windless night resulted in nailing down some key species. In an interesting last-minute twist, Dave made a major route change less than 48 hours before our day. He and Fran abandoned part of last year's route because it had not been producing as well as in years past. Dave spent one morning checking out a 'new' area further to the north that he thought looked good for a variety of breeding species based on habitat. His results here were good enough for him to pull a risky but aggressive last-minute switch. The downside of this switch was that none of us knew this area well at all, so we had to work with two mornings of scouting by Dave and nothing else. Picking the date: As we entered our five day window, we could easily rule out the 18th and 19th due to continued rain and wind. Some inclement weather can actually be helpful, but a steady soaking rain is no good. We found ourselves in an interesting conundrum. Frank, Patrick and I had scouted several species of lingering waterfowl along the coast, many of which were likely weather-related. On the other hand, some late migrants were just arriving, and in an ideal world Dave and Fran wanted the 20th to scout to make up for time lost to rain. Would we be robbing Peter to pay Paul by going as soon as the rain eased up a bit? We decided that we had more to lose by waiting, so we took the first day on which the weather seemed decent, which was Friday the 20th. The Big Day: We met at 11pm at our usual Dunkin' Donuts in Cromwell, loaded into one vehicle, and drove to our first stop. The first part of our night was based in the center of the state where we picked up goodies like Sora, Upland Sandpiper, Grasshopper Sparrow, Whip-poor-will, and two owl species. Before first light we headed to Litchfield County where we unfortunately dipped on Northern Saw-whet Owl. Dawn in the NW corner yielded tons of birdsong and we really started to amass a list. 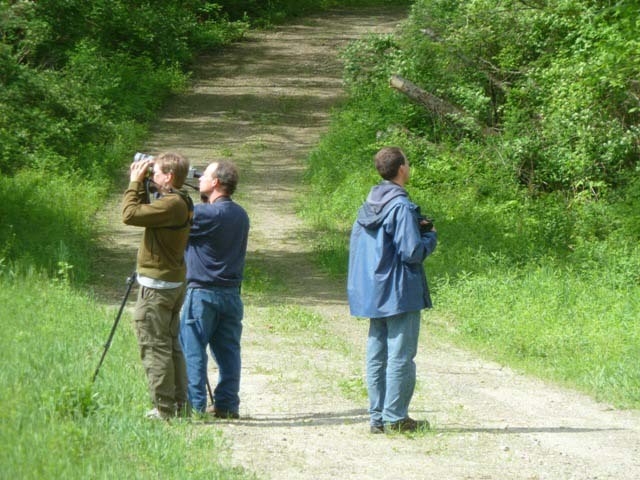 Highlights included breeding Dark-eyed Junco and Golden-crowned Kinglets. White-throated Sparrow managed to elude us...ouch. But a surprise Rusty Blackbird that appeared briefly for Dugan and Zygmont before plunging toward the wooded stream made up for that miss. A migrant Nashville Warbler, often a tough bird on big days, sang for us. Acadian Flycatcher was a nice surprise at a location that seemed atypical for breeding, so this was likely a migrant. Our only cuckoo of the day, a Yellow-billed, called from the same location. Moving to a different area we added a pumping American Bittern to the list and continued to tally the nesting passerines. The quality birds continued as we were birding a perennially productive stretch of road in West Cornwall, when we heard the call of "QUICK, THREE BEERS" behind us. This Olive-sided Flycatcher came as a surprise and would be a strong candidate for 'Bird of the Day' honors. We eventually worked our way to the Kent area for Cerulean and Hooded Warblers. Still missing Purple Finch and a couple other inland birds we decided to swing through White Memorial in Litchfield. No PUFI to show for it, but we did turn up a White-crowned Sparrow at the feeders. We then departed the Northwest at precisely 11:33am with 131 species. Despite a few big inland misses, a quick check of the scouting materials revealed that the record was still within reach. The skies had turned unexpectedly sunny in the NW part of the state, so we were just hoping that our scouted birds along the coast had not left when the weather cleared! En route to the coast via Route 8 we made a few convenient stops to add some species to the list. We hit the coast as high tide approached so we headed straight to Milford Point. Here we ticked the usual shorebirds plus a single White-rumped Sandpiper and a late Great Cormorant (a big surprise, as this was not a scouted bird). Three Laughing Gulls in the marsh were a nice tick, and a male Harrier coursed over the marsh (could they be breeding locally?). From Milford we went to Stratford for more shorebirding and otherwise. Waterfowl included Greater Scaup, White-winged Scoter, and Red-breasted Merganser. Frank picked out a Red Knot among the roosting shorbs. At this point we faced a major decision. Should we head west to Westport for a reliable lingering Northern Pintail? Keep in mind that this was around 3pm on a Friday afternoon, meaning that the traffic on the way back from Westport would be miserable. We estimated at least 40 minutes for just this one bird, likely longer, but could not pass up the urge to tick the pintail. We got the bird with minimal time wasted (thanks to Tripp's spotting) and picked up nesting Peregrine Falcon as well. That put our total at 177 species. As expected, the traffic heading back east was brutal, turning the jaunt into a full hour. At this point we were wondering if we had just cost ourselves a shot at the record. It was clear that we would have to be incredibly efficient from this point onward, and our intense coastal scouting would have to pay off. Thanks to rough traffic and a couple unproductive stops, we were stuck at 177 for two hours! We got off the Hammonasset exit, headed to an active nearby Raven nest, and FINALLY added another bird to the list. Then it was into Hammonasset for a great run of new birds in what would be one of the best hours I've ever had on a Big Day...and what perfect timing. Here at Hammo we added expected species such as Glossy Ibis and Little Blue Heron. We stepped atop Meigs Point and began scoping. First, Purple Sandpiper. Then, Northern Gannet (thank you east winds!). A Red-throated Loon was clutch because our previously monitored RT Loons had vanished the day before. A couple other more expected species brought the list to 185...our total from last year and just ONE away from tying the record! Coming off Meigs Point we spotted a small duck in the marshy pool next to the parking lot...Blue-winged Teal! 186! And here was the best part about tying the record at that point: we knew for a fact that the record would soon be ours alone. Why so sure? Because we still had one gimmie left: Seaside Sparrow. A quick check of the marsh near Willard's Island revealed a teed-up Seaside waiting for us. We took a few seconds to exchange high-fives, handshakes, and fist-bumps to acknowledge the accomplishment. It was right back to business as we discussed if/how we could reach 191. We still had a few possible species in the bank, so it was a matter of being smart, efficient, and lucky. This may sound ridiculous but at about 20 hours into a big day, one becomes very capable of making stupid decisions. Next up was a Horned Grebe that Frank had found the day before...we were very pleased to find it was still there. 188. A raft of 100+ scoter offshore were close enough to scope. A single drake Black Scoter was among this group of Surfs. We had previously seen dozens of scoter along the coast, some sitting and some moving, but had not yet found a Black. 189. Then an unsuccessful search for Long-tailed Ducks a bit further west, where we had them a couple days earlier. Our final daytime stop was in East Haven at dusk, where two pair of Common Eider continued that I had found several days earlier. Sweet. 190. At this point we had a few nighttime possibilities scattered all across the state from Stamford to Canaan to the CT River Valley to Lyme, but we only had a few hours til midnight. We did the math and came up with a route that gave us the most potential species, scouted or not, in hopes that we would get lucky. We drove (quickly!) east to Lyme where I had scouted two White-eyed Vireos. They can sometimes be coaxed to call at night, so we decided to give it a shot. Absolutely nothing. The fog in Lyme was dense, the air was cool, and nothing was talking. A jaunt down Ely's Ferry Road to the silent marshes at the end of the road confirmed that the birds were quiet in the lower CT River valley tonight. We got out of Dodge and made a B-line to one of our favorite marshes further north up the river where we would spend the rest of the night. Here the fog had not set in and the air temp was considerably warmer. We were hopeful for a surprise or two. After dipping on two scouted Least Bitterns, we hoped we would get one here like we did in 2010. Sure enough a Least Bittern cooperated and brought us to 191, tied with the Massachusetts number set in 2009 for the high count by a New England state, which was fun since the MA guys that hold their record (Garvey, Iliff, P. & J. Trimble) are friends of ours. At this point we were closing in on midnight while waiting and listening. Hey, there are Black and King Rail records for this marsh, so who knows? What did happen next was not expected, however. With just a few minutes to spare a Barn Owl screamed at us, simultaneously sending chills down our spines and smiles to our faces. 192. Could the day have ended any better? Upon arriving back at the car we lit up some cheap victory cigars I brought along in anticipation of a record-breaking day (confident, not cocky...). 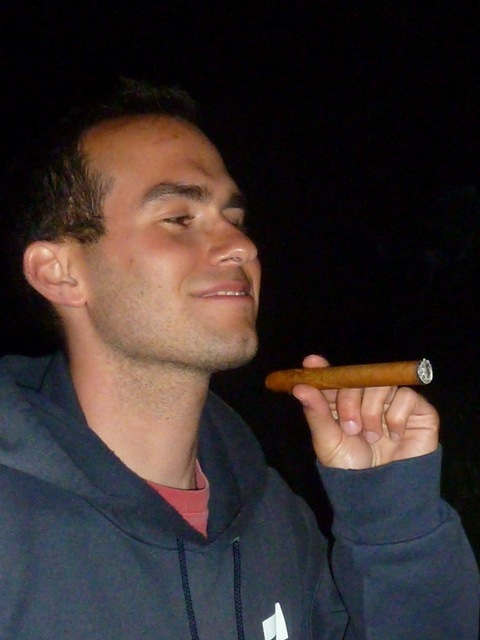 After 24+ hours without sleep already on top of deprivation, we figured cigars were a bit safer than beer! We relaxed (for once) and shared our favorite moments of the day before departing for a well-earned night's sleep. Analysis: One word: Successful :-) We improved on last year's number mainly thanks to date flexibility and improved coastal scouting. Dave's route change, despite being further north, saved us some time by getting us several tough species in the same general area. We were able to pick a day that ended up being rain-free but not so hot and sunny that birds stopped singing early or heat shimmer was a major issue. Got lucky with a few birds but not so lucky with other species we knew were there but did not cooperate. We only tallied 24 species of warbler, which for a Big Day in CT is not a great number...for instance I've tallied 27 warbler species on two prior big days. Waterfowl was key, thanks in part to the recent crummy weather and east winds. We put together an impressive total yet still left some birds on the table that we should have gotten and several we could have gotten. But it's not a Big Day without misses. You just can't get every bird. Still, there is room for improvement here. 200 species in a day in CT used to sound impossible, but maybe it's not so outlandish after all. Misses (likely birds or ones that we had scouted til the 19th or so): Tricolored Heron, Long-tailed Duck, Black-billed Cuckoo, Northern Saw-whet Owl, Winter Wren, White-eyed Vireo, Wilson's Warbler, White-throated Sparrow, Purple Finch...plus many "possible" species. Bird of the Day: Blue-winged Teal...because it tied the CT record and was a total shocker at the time. It also capped an incredible run of birds seen from Meigs Point that really pushed us to the record. The other team members may well pick a different bird. Other candidates for this honor are Olive-sided Flycatcher and Barn Owl. HUGE Thank You's to the friends who took the time to provide tips on particular birds, and to the CTBirds readers and contributors who reported their sightings and contacted us directly. Despite doing a ton of scouting ourselves this year, we still recorded two species that we learned of solely via friends or CTBirds reports (Pintail in Westport, and Red Knot at Stratford marshes that saved us a trip to Sandy Pt where I had one the day before). Without so much scouting that number would have definitely been higher. We had backup spots for many, many species via friends and CTBirds just in case our scouted individuals did not cooperate. Having backup spots for all possible species is crucial. Thank you all! mostly dry and entirely thrilled! Congratulations! and a great story - fun to read. Thanks for your interesting and thorough account. It is nice to see that you accord the Olive-sided Flycatcher as a candidate for bird-of-the-day. On Tuesday of this week, I was with Neil Currie (also in West Cornwall) and I spotted a flycatcher sitting atop a dead tree overlooking a swamp. 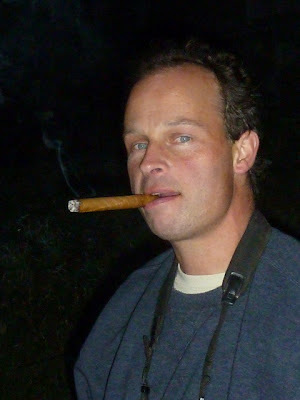 Neil's face lit up and said he thought it might by an O-S flycatcher. We scoped it and indeed that's what it was. We were excited of course but I relate this story in testament to Neil, an éminence grise of Connecticut birders. He said he'd only seen 5-6 of these birds in Connecticut, always in such a situation. He continues to amaze, instruct and of course, entertain me. Congratulations to you and the team! Congrats! You've really earned it! I wish that could have been there. -E.J.